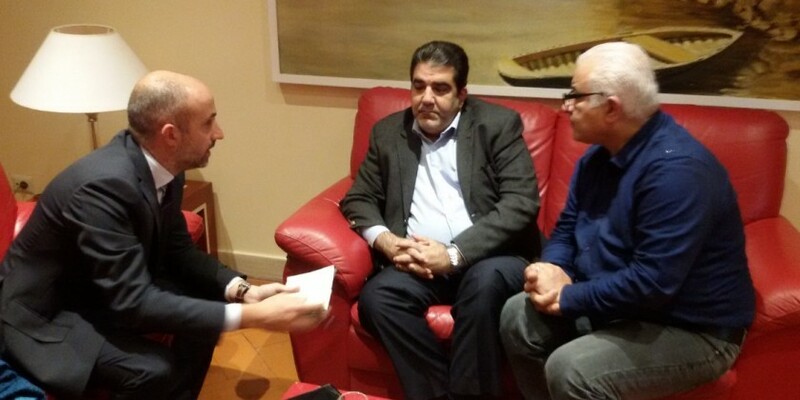 Interview with Nawar El Sahili member of Lebanese Parliament, conducted parallel to the meeting “La Causa” organized by the Association “Amici del Libano” in Rome on December 12th 2015. Nawar El Sahili is a member of Hezbollah. He comes from Hermel, a town north-east of Lebanon close to the Syrian border and he graduated in Law from Lille University. He received in 2009 a second parliamentary mandate after his election in 2005. MB: Let me explain that, besides writing about Lebanon, I also write about terrorism and I’m following the evolution of the scenario in Syria. Many people have been speaking about the attacks in Paris but I believe that we should talk about Beirut, Paris and everything that has happened in Mali. The Member of Parliament nods his head and adds that Tunisia should also be included in the list of recent terrorist attacks which happened within a few days of each other. Talking about the situation in Syria today, there are approximately 160 al-Nusra Army of Conquest Jihadist rebel groups on the battlefield and groups which are at war with each other; then there are 18 Shiite militias, including Hezbollah which are part of Iran’s sphere of influence. We have a lot of players on the field and, for the first time, at the meeting in Vienna, the main protagonists of the Syrian conflict sat around a table: Iran, Saudi Arabia, Turkey, the United States and Russia. It should be possible to find other interlocutors who can become involved in the peace process; I am thinking about the fighters in the Free Syrian Army with whom Russia itself has a communication channel and the Kurdish militias. Nawar El Sahili: I do not agree with the image of groups which oppose one another because, expressed in these terms, it seems as if there is opposition between Sunnites and Shiites and, as confirmation of this, it should be made clear that the majority of the fighters of the Syrian Army is made up of Sunnites and when al-Nursa and ISIS or other groups fight against each other, this is due to al-Qaeda, a Sunnite group but not real Sunnites. The problem is between terrorism and anti-terrorism and between the two sides. The axis which wants to topple the Syrian regime, Turkey, Qatar, Saudi Arabia and behind them the United States and the axis of the resistance , consisting of the Syrian regime and its Hezbollah allies with Iran and Russia behind them . For this reason, the only viable solution is political because it has been demonstrated that it is impossible to overthrow the regime in Syria. Vienna is a good start and we hope that this open dialogue can continue in New York and when Russia and the United States meet with Iran, Saudi Arabia, Qatar and Turkey they will come to an agreement to finish the crisis in Syria and at that point, the real political solution will begin. MB: Is it possible to envisage a repetition of the strategy applied with the 5+1 for the negotiations regarding the Iranian nuclear issue for the crisis in Syria and perhaps also in Libya? Nawar El Sahili: It is a good idea to talk about the situation in Libya because nobody is really interested in the Libyan situation. MB: I must point out that, as an Italian, I am worried about what is happening just a few hundred kilometres from our coastline and one can understand that Italy has bonds with and is interested in Libya. Nawar El Sahili: If the main players in this crisis come to an agreement, they will be able to enforce a solution on the ground. These conditions are not present for example in Syria where the Free Syrian Army is not a real power capable of imposing a solution on the ground and therefore, as a consequence, the coalition has nobody on the ground. The ones who have the real strength on the battlefield are ISIS, the army of Islam, the al-Nusra Army of Conquest. These groups were born from al-Qaeda but my question is where did they get the money from? How do these men arrive in Syria? Which are the open borders which allow these groups to communicate with the outside? When we have found the answers to these questions we shall begin to have the solution. As we say in Lebanon, when we have put off the tap which provides funding and when we have shut down the borders through which the fighters enter, we will have a solution in Syria. MB: The approach to constraining or confronting ISIS must be an approach which involves all the implicated countries. A defeat on the ground in Syria and Iraq does not automatically mean the end of ISIS which, it seems, is moving to Libya. This compels us to form a common strategy against the foreign fighters. How can the problem of funding be dealt with at a collective level? Nawar El Sahili: The financiers must be identified and I do not think that this is much of a secret. There are two main countries and businessmen in these main countries: Saudi Arabia and Qatar. Then there is the question of the sale of petroleum which is sold as contraband by ISIS to Turkey. Let me ask you a question: if I have to transfer 10,000 dollars from one bank to another, the Americans would be able to trace this almost immediately. How is it possible that hundreds of millions of dollars are circulating in favour of ISIS without the Americans knowing where this money comes from and where it goes? This is a direct and an indirect way of saying that the Americans have been supporting ISIS and now they have become aware of the danger. Thousands of cross-country vehicles arrived in Syria and Iraq from Japan. How did they arrive? How did they enter the country? Who bought them? Who sold them? If we can get sincere replies to these questions, this means we shall begin to find a solution. MB: Something important happened in Lebanon recently. I am referring to the exchange of prisoners between al-Nusra and the Lebanese authorities. Some Jihadists imprisoned in Lebanon and one of al Baghdadi’s wives were released in exchange for the release of 16 Lebanese soldiers captured in August 2014. What ideas did Hezbollah have regarding this event? Nawar El Sahili: Initially, we expressed our joy for the release of these soldiers and the fact that they were able to return home. The Director of the General Security of Lebanon revealed a secret when he reported the news that the leader of Hezbollah Hassane Nasrallah had been in contact with an intermediary in Qatar in order to facilitate the release of the prisoners. This demonstrates the link between Qatar and these terrorist groups. Included in this agreement was the wife of Baghdadi, though, to tell the truth, they have been divorced for 7 years. The woman refused to return to the territory where al- Nusra is located and she wants to remain in Beirut and then go to Turkey. MB: When I interviewed your colleague Mussawi, it was 2013 and he explained to me that Hezbollah waged a preventive war in order to stop the advance of ISIS in Lebanon. During those years on the battlefield there was Hezbollah with Assad and the Iranians on one side and then there were the Kurds. The paradox these days is that Hezbollah, which was a Lebanese political party, has become a player like a state. This coordination between Russia, Iran and Hezbollah is a new page in the history of the party of God since its inception at the end of the seventies, the years of the civil war, its entry into politics and, then, the resistance. Today Hezbollah is part of an international coalition. How do people feel about this evolution? Nawar El Sahili: We are proud to be considered a regional force. The answer to the question is in a phrase of our General Secretary: “ we will always be where we have to be “. Undoubtedly, our intervention in Syria was late considering the events which had taken place two years before. I have the honour of being a member of Parliament for the area on the border of Syria and where I come from there are 25.000 Lebanese who live in Syrian territory and are soldiers in the Lebanese army. These people were terrorised and killed by these terrorist groups from 2012 until our intervention. When we saw that the Syrian army, which was busy all over the country and was not able to protect these Lebanese citizens as well as the Lebanese army, which, being a regular army, could not go into Syria to defend them, we decided to carry out a preventative intervention in Syria. So when we saw that the objective of these groups was not the same one as at the beginning and that they had spread into Iraq we realised that we would have to act in a different way and we continued to fight. It is for this reason that, today, we find ourselves fighting side by side with the Syrian army and other allies with air cover from the Russian air force all over Syria. President Putin has declared that he is fighting terrorism in Syria before it arrives in Russia. What should we have done with these groups on the outskirts of Lebanon? MB: What is your opinion of the group which took to the streets in Beirut this summer to protest against the rubbish crisis? Do you think this movement could be transformed into a political force? Nawar El Sahili: Undoubtedly, this civil movement put forward requests which interested all the Lebanese factions. But the social complications in Lebanon and the multi-confessional system will not allow this movement to go any further than it already has. This is our confessional system. I hope that one day this type of system can be overcome and, at that point, civil movements will achieve their aims and thus political groups will really feel in danger. MB: What contribution can Italy make regarding the situation in Syria and what proposal can it make in Libya? Nawar El Sahili: I think that Italy and the majority of European countries must remain independent of the American positions. Europe must become a super-power and Italy is one of the strong countries in Europe. Italy must have a strong foreign policy and be independent and it must fight terrorism with military actions. A military solution against terrorism is necessary both in Syria and in Libya; it is also necessary to understand who the financiers of these groups are and how this ideology developed as an ideology which fights everybody who does not conform to their way of thinking and defines them as heretics. I am glad that you are taking an interest in Libya, a country which has not been present on the international agenda for too long. Paris attacks: Is bashing Belgium justified?